SAN BERNARDINO, Calif. /California Newswire/ — Patton Sales Corporation, a steel service center and manufacturer based in Ontario, has expanded its business, the San Bernardino County Workforce Investment Board announced today. Two years ago, Patton Sales Corporation was in danger of laying off employees. Owner Jon Novack needed to diversify his business, but funds for the necessary new equipment, employees, and training were in short supply. The Workforce Investment Board of San Bernardino County contacted Novack about an On-the-Job Training program, which would reimburse the company for a portion of a new hire's wages during a specified training period. The Workforce Investment Board would also help recruit the new employees. Patton Sales Corporation hired eight people through the On-the-Job training program. The money saved through this program gave the company the confidence to make capital investments in equipment that would help the company grow. Two years later, Patton Sales Corporation has announced its expansion, where it opened a 15,000 square foot facility that employs six people. "Without the help of the Workforce Investment Board, we would not be where we are now," said Novack. "The programs helped us avoid layoffs and save more than 20 jobs. We eventually were able to expand our business, and we hired eight people through On-the-Job Training programs offered by the Workforce Investment Board." The Workforce Investment Board assists many others with finding gainful employment and building a career locally. Patton Sales Corporation also hired three more staff members in Ontario as drivers and administrative staff to support the new location. "Patton Sales Corporation and its employees are among many finding success with help from the Workforce Investment Board of San Bernardino County," said Sandy Harmsen. "The Workforce Investment Board offers a wide range of services to support the County's employers." The Workforce Investment Board offers a variety of services including: employee recruiting and prescreening, workshops and process improvement programs, and the WIB has the ability to connect businesses with federally funded On-the-Job Training, a program that offers a wage reimbursement for part of an employee's earnings during a set training period of up to six months. "Our County Workforce Investment Board is a national model recognized for supporting employers while simultaneously helping workers keep their jobs and giving new opportunities to job seekers," said Janice Rutherford, County of San Bernardino Chair and Second District Supervisor. "These programs are vital to our region's economic recovery." 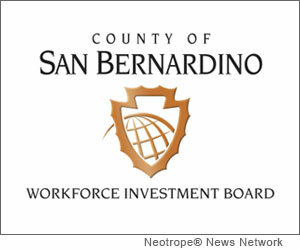 The Workforce Investment Board of San Bernardino County (WIB) is comprised of private business representatives and public partners appointed by the County of San Bernardino Board of Supervisors. The WIB strives to strengthen the skills of the County's workforce through partnerships with business, education and community-based organizations. The County of San Bernardino Board of Supervisors is committed to providing county resources, which generate jobs and investment. The WIB, through the County of San Bernardino's Economic Development Agency and Workforce Development Department, operates the County of San Bernardino's Employment Resource Centers (ERCs) and Business Resource Centers (BRCs). The ERCs provide individuals with job training, placement and the tools to strengthen their skills to achieve a higher quality of life. The BRCs support and provide services to the County's businesses including employee recruitment. Employers and job seekers who are interested in the Workforce Investment Board programs may call: (800) 451-JOBS or visit www.csb-win.org . Also follow us on: Facebook http://www.facebook.com/SBWIB or Twitter @InlandEmpireJob; and YouTube http://www.youtube.com/SBCountyWIB .